Figuring out whether a snake's bite will deliver deadly poison can help put your mind at ease when encountering one in the wild. A quick way to identify venomous snakes is to look at the shape of its head: an arrowhead-shaped head means it's potentially venomous. You can use a number of other visual guides to identify venomous from non-venomous snakes. Venomous snakes are classified into groups based on shared genetic characteristics and geographic location. Nearly all of them have triangular or arrowhead-shaped heads. Cobras and mambas (Elapidae) are most often found in Africa, Asia and Australia. The true vipers or Old World vipers (subfamily Viperinae) live in Europe, the Middle East and Asia. The cottonmouth and copperheads (genus Agkistrodon), rattlesnakes (Crotalus) and coral snakes (Micrurus) are all found in North America. Coral snakes are related to cobras, so they're dangerous even though they don't have the characteristic arrowhead-shaped head or cobra hood. Snakes' heads can be categorized into roughly three sizes: narrow, medium and wide. A narrow head blends almost seamlessly with the neck. A medium head is slightly larger than the neck, with somewhat rounded jaws. A wide head is what would be classified as an arrowhead, with the snake's jaws being considerably wider than the neck. In general, a wide head means a venomous snake. Many non-venomous snakes flatten their heads when they feel threatened, making them look broader, so this method of determining whether a snake is venomous should be coupled with other indicators. North American vipers have two pits in their faces between the nostrils and the eyes. This is how pit vipers got their name. Non-venomous snakes have no such pits. These pits sense heat, which help the snake find prey. 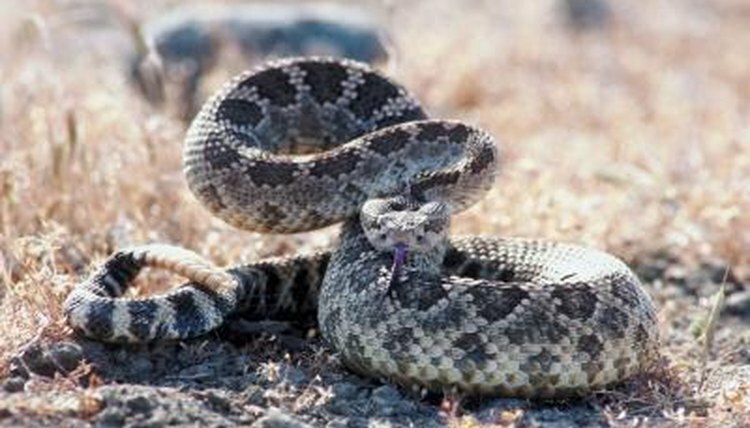 The eastern diamondback rattlesnake, cottonmouth and copperhead are all examples of venomous North American vipers. Old World vipers don't have these pits, but they are still definitely dangerous snakes and can be identified as such by other means. Almost all venomous snakes have vertical pupils like cats. Non-venomous snakes have round pupils in the center of their eyes. Some nocturnal non-venomous snakes have horizontal pupils that help them see at night. Many species of venomous snakes have scales that jut out over the eye, like the eyelash viper (Bothriechis schlegelii). This distinctive facial feature gives these venomous baddies an exceptionally angry-looking appearance. It's in the best interest of non-venomous snakes to look like venomous snakes so they're given a wide berth by would-be predators. The harmless Eastern hognose (Heterodon platirhinos) is known for flattening its head when threatened, making it look more menacing. The nonvenomous scarlet snake (Cemophora coccinea), scarlet kingsnake (Lampropeltis elapsoides) and red milk snake (Lampropeltis triangulum) all look similar to the coral snake, with horizontal bands of red, black and yellow. To determine which of these snakes is venomous the rhyme, "Red touches yellow, you're a dead fellow, red touches black, you're OK Jack," was developed. The gophersnake (Pituophis catenifer deserticola) flattens its head and shakes its tail while making a hissing noise so it resembles the western rattlesnake (Crotalus viridis), but the gophersnake is all bark and no venomous bite. Outdoor Alabama: Is That Snake Poisonous? Venomous Snakes of the World: O'Shea, Mark.